Photography degree schools come in as wide a range of educational opportunities as can be found. Non-degree schools can be found locally and online. Community colleges may offer associate's degrees in photography. Throughout the country, students can pursue a four-year bachelor's degree in photography at colleges of art and design such as the Rhode Island School of Design/RISD and Corcoran College of Art and Design. Bachelor's level photography degrees are also offered at national premiere institutions that offer a wider education, including Rochester Institute of Technology, UCLA, and Stanford University. Photography students interested in extensive, specialized photography studies can pursue a Master of Fine Arts in Photography degree at a number of schools across the country. MFA programs tend to be very small, selective programs offering considerable studio experience and exposure to a range of professionals. Some schools that specialize in photography studies offer certificates rather than degrees. These include the New England School of Photography, the Hallmark Institute of Photography, and the Center for Digital Imaging Arts at Boston University. Although these schools do not offer degrees, they are usually accredited. The range of options allows prospective students to choose a school based on cost, desired degree, and location. Students just out of high school looking for a low-cost local education that will allow them to enter the work force quickly should consider an associate's photography degree program at a community college. Students looking for a complete college experience and complete education can start at or transfer to a bachelor's degree program. College graduates looking for a specialized degree and in-depth course and lab work should explore Master of Fine Arts (MFA) in Photography degrees. Generally, master of fine arts in photography programs look for students with a bachelor's degree in photography. These schools will also consider applicants with any bachelor's degree and considerable experience in the field of photography. Schools that focus on photography alone will sometimes allow experienced photographers to bypass entry-level courses. Future goals are critical to choice of photography degree school. The desire for a fast path to work as a photographer likely means an associate's degree program is the best choice. Beyond that, applicants should consider the photographic specialty they would like to pursue and apply to colleges offering detailed course and lab work in that specialty. For example, students interested in the biomedical field should consider Rochester Institute of Technology with its one-of-a-kind Biomedical Photographic Communications program. Applicants interested in fashion photography should apply to programs with an associated major or concentration. Options include the School of Visual Arts in New York offering a one-year Master of Professional Studies in Fashion Photography program, Academy of Art University in California offering an MFA in fashion photography, and the Fashion Institute of Technology in New York offering a two-year associate's degree in photography. Students interested in underwater photography should narrow their choices to the few schools that include that programming. Cost is often a factor in choosing a photography degree program. Students want a good return on their investment. Applicants shouldn't assume what final costs will be until completing the financial aid process. Once financial aid awards are complete, applicants can compare the cost of different programs. Students should look at tuition, living expenses, and equipment expenses. Equipment expenses can be substantial for a photography major. 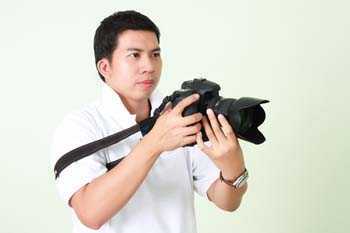 Schools offering a bachelor's degree in photography often require the SAT or ACT as well. Many associate's degree programs will not require a portfolio. Photography degree applicants should track due dates for applications to ensure all paperwork is submitted in a timely fashion. Carefully check college websites and the application packet for information on portfolio submission. Schools are often specific about the format, type, and number of photographs they wish to see to evaluate an applicant's work. A carefully crafted artist or personal statement will allow schools to understand the applicant's creative vision, as well as what the applicant hopes to learn from his or her upcoming years at the school. Prospective students should also visit any campus under serious consideration. An opportunity to visit this dynamic environment and evaluate important resources like shooting studio space, number of computers available, and vibe should be taken. Accredited photography schools have been evaluated by an accrediting authority to ensure they meet or exceed established criteria. Accredited schools are trusted to provide a quality education and work for ongoing improvement. Accrediting authorities may be national or regional and are recognized by the U.S. Department of Education or the Council of Higher Education Accreditation. Choosing an accredited school offers some confidence in programming and administrative standards. Some types of financial aid are only available to students at accredited schools. The National Association of Schools of Art and Design (NASAD) establishes national standards for undergraduate and graduate degrees. The U.S. Department of Education (USDE) recognized NASAD as the accrediting body for institutions teaching art and design. Institutions complete a self-study and are visited by an on-site review team so that the accrediting body can determine if the institution achieves its own educational objectives while meeting the established accreditation standards. Accreditation standards cover basic competencies and operational conditions. NASAD is professionally affiliated with the AIGA, the Professional Association for Design, and the IDSA, Industrial Designers Society of America, and receives affiliate input regarding standards. NASAD's 300 members hold accredited status and can be found in their site directory (http://nasad.arts-accredit.org). Photography degree schools may also be accredited by regional commissions. The six regions are Western, New England, Middle State, Northwest, North Central, and Southern. The Parsons the New School for Design accreditation, for instance, is from NASAD and from the Commission on Higher Education of the Middle States Association of Colleges and Schools. A private school in California must list with the California State Department of Education so that it may be accredited by the Western Association of Schools and Colleges. The goal of any accredited school is to meet the rigorous standards that reflect an effective photography degree program and demonstrate the capacity to improve.